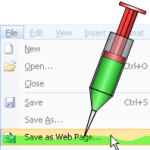 The Visio Save As Web feature creates all sorts of files that will confuse the buhjeezus out of you. But they’re mostly small files. They just sit there on your hard drive, looking up at you, begging you to open them up and modify them. I dare you to peek inside the sub-directory that is created when you do an export! See if you can resist! Oh sure, there’s a lot in there. Good Lord, there’s the almost dead .vml-language output that gives you a vector-representation of the Visio drawing. This serves you well when you pan and zoom in the browser, but one wonders about the future. There are .gif images. A .css stylesheet controls the look-and-feel of the export. There are .emz files–I don’t know what those are for! There are .xml data files to hold Shape Data fields and other information. And java-script .js files perform fancy functions – after you click the button to ignore the security-warning, of course. And then there are actually multiple .htm files, if you’re not confused already! Phew! It’s enough to make you forget it all and go back your real job! 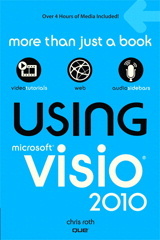 Luckily, John Goldsmith, who authors the Visio blog:Visual Signals, has been chipping away at all those files, slowly figuring out what they do, and writing about them in a series of articles. Since John is sure to add more articles (hint, hint! ), you can keep up with the latest by having a look at his Save As Web category too: Visual Signals: Save As Web Category.